When an Atlanta-based reader shared this recipe with Giora Shimoni, it was dubbed "Egg Souffle." But this dish isn't as fussy as a souffle -- there's no need to whip egg whites, own a souffle dish, or to worry about the dish falling. Think of this light and cheesy kosher dish as a cross between a frittata and a quiche, made sans crust, of course. Filled with mushrooms and topped with tomato rounds, it's perfect for a family brunch, served with fresh bagels and fruit salad. Or make for a late-night meal, when breakfast for dinner sounds ideal. Make it a Meal: For a light lunch served al fresco, serve a slice of this crustless quiche with a salad, such as this Avocado, Hearts of Palm, Edamame & Za’atar Salad. For a more substantial meal, add a cup of soup, such as this Roasted Carrot, Apple, and Celery Soup, or this easy-to-customize Pureed Butternut Squash Soup. For dessert, offer this Rustic Whole Grain Layer Cake With Strawberries and Cream, along with tea or coffee. 1. Preheat the oven to 350° F (180° C). Grease a 9x9x2-inch casserole dish or quiche dish. 2. In a large bowl, whisk together the flour, baking powder, salt, and pepper. Set aside. 3. In another large bowl, beat the eggs. Add the cottage cheese, cheddar cheese, melted butter, onion and mushrooms. Mix well. 4. Whisk in the flour mixture, mixing well until the flour is fully incorporated. Pour the mixture into the prepared casserole dish. 5. 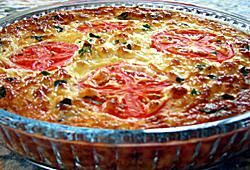 Arrange the tomato slices on top of the quiche and push them slightly into the surface. Sprinkle the quiche evenly with the parsley. 6. Bake in the preheated oven for 40 minutes, or until the quiche is set, the top is golden, and a tester inserted in the center comes out clean. Allow to rest for 5 to 10 minutes before slicing into wedges and serving.